We’re sure we had other clothes when we were growing up but judging from our family photo albums it does appear that our parents disproportionately dressed us in rugby shirts. Being a sport-mad family with dogs who would happily chew your arms, it’s now clear that the rugby shirts were more for protection and practicality than anything else. Our old school rugby shirts never seemed to wear through and were handed down the family and often repatriated to cousins or friends to see if they could wear them out. It was only when we grew up and had children of our own that we realised how much the rugby shirt had changed. Not only were they getting thinner and a lot less durable but they were becoming uncomfortable to wear. In part, this was due to the use of cheap poly/cotton blends but mainly it was down to the shirts being covered in sponsorship logos. Invariably, the main sponsor’s logo would be emblazoned across the chest but now logos also adorn the sleeves, the collar and the back giving the shirt the feel of a hessian sack, the comfort of a straight jacket and the look of an advertising sandwich board. So we decided to bring back the quality of the old days and start making proper rugby shirts and to make them even better than before. Starting, as one does, with the notion that it would be good to buy British it soon became clear that this would prove difficult, so we ventured around the Far East on a grand tour of China, Vietnam and Cambodia and then on to the subcontinent; India, Bangladesh and Sri Lanka. Despite some early positive signs and plenty of enthusiasm, it was evident that what we wanted to achieve was too difficult and we were ready to pull stumps on the project. We then started to notice that the ‘made in Portugal’ labels were not only popping up in socks and pants but in wonderful t-shirts, sweatshirts, shoes – you name it, they made it. With that we flew to Portugal and started visiting factories, stumbling across a manufacturing network in and around the delightful city of Porto, which has retained its own heritage of excellence and quality, sure in the belief, that like their port wine, people are prepared to pay for the best. 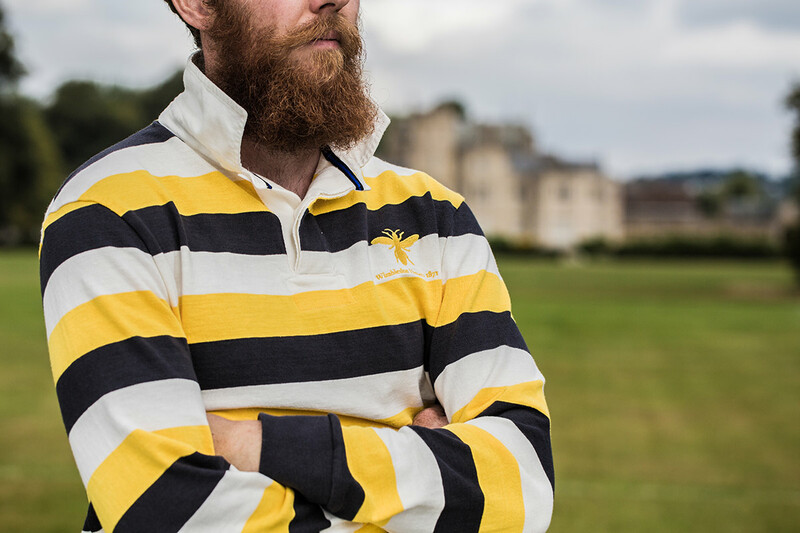 Our remit was clear: To make a comfortable, hard-wearing rugby shirt that looks as though you’ve had it for years. The first process is the selection of cotton. Getting the balance right between comfort and durability is something that most brands get wrong: Poly/Cotton blends may give a soft feel but they wear through more quickly and lack breathability. 100% Cotton is the traditional way to go but gets the wrong count of cotton and you could get shrinkage and stiffness following washing. 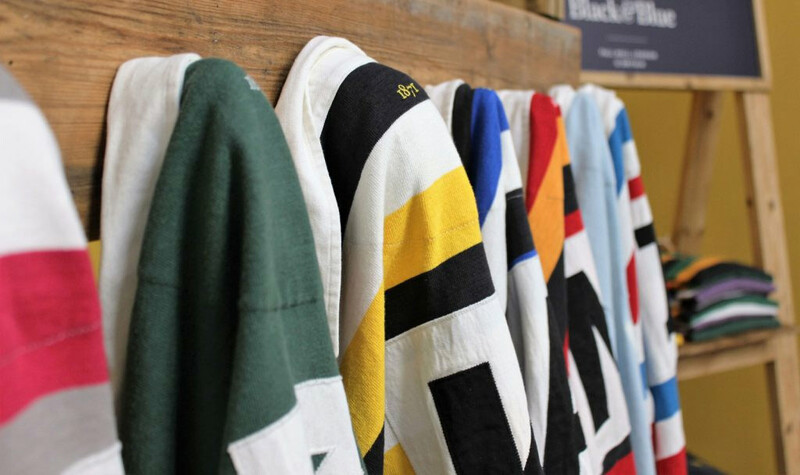 Our rugby shirts are made with a 100% slub cotton which offers a wonderfully worn-in texture with a soft finish. The construction of the fabric allows the cotton to feel like new after each wash, without shrinkage or stiffness and because there is no polyester the shirts are durable enough to play 80 minutes in. Our shirts go through a lot of processes. Here’s a glimpse of how the shirts are made. Our slub cotton fabric being made. Once the fabric’s made it’s sent to the dye house where all the Pantone referenced colours are digitally mixed so the colours are as accurate as possible. The fabric is cut into sleeves, collars, cuffs and the body in all sizes and then sent for all the various detailing to be added. First, it goes to the embroiderers to apply the individual club logos and our 1871 branding on the back of the neck. We take great care to ensure that the embroidery includes as much detailing as possible, layering and structuring each image so they reproduce as accurately and clearly as possible on the shirts. Then it’s off to our team of seamstresses to apply the patches, numbers and letters to the backs of our rugby shirts. And then the neck labels. All the pieces are then sewn together with any extra detailing, like the special black and blue neck tape, the buttons and the reinforced hems added before the shirt is sent off for the washing process. After quality control, the shirts are steamed, ironed, folded and packed with great care and precision ready for dispatch.